As American Heart Month 2016 winds down, I’d like to shift my focus to an area that we don’t always associate with heart issues – toxins. Toxins are everywhere; there is no doubt about it. In the air we breathe, in the water we drink, in the food we eat, in our homes, in most products we use—even in the most pristine places on earth—toxins are there. Truth is, toxin accumulation can directly impact our cardiovascular system, and many times will manifest as high blood pressure, increased atherosclerosis, and ultimately heart issues. Toxins are chemicals that interfere with normal functions in the body, and most have been associated with adverse health effects. At this point, the Centers for Disease Control (CDC) regularly measure over 200 toxic compounds, tracking the levels in different aspects of our population. However there are 80,000 chemicals currently in use! Although the CDC adds new chemicals to track annually, it’s simple to see that we will never be able to really understand the full impact of the substances we’re all exposed to. The sad fact is many chemicals contribute to cardiovascular disease – either directly, or indirectly – through an increase in oxidative stress and general systemic inflammation. So what is oxidative stress, also known as oxidation anyhow? It is one of the main drivers of inflammation in the body. Inflammation is at the root cause of heart disease, and for that matter, all other chronic disease as well. Consider this analogy illustrating the destructive properties of oxidation: Oxidation is like a punch thrown from a bully (the oxidant), and it can easily lead to a full-blown fight if enough molecules get involved. Destruction results. Oxidation occurs when there are not enough antioxidants (the peacekeepers) around. Oxidative stress triggers inflammation and regarding cardiovascular issues, it initiates the destruction of the lining of the blood vessels, called endothelial dysfunction. Atherosclerosis involves endothelial dysfunction and chronic inflammation in the artery walls, progressing to the buildup of plaque and eventual cardiac complications such as heart attack and stroke. So I’m sure you can clearly see how toxins that increase oxidative stress are definitely the enemy. And antioxidants are our friends. It is a myth that nothing can be done about toxin exposure. The fact of the matter is that supporting the body’s seven channels of elimination – colon, liver, lungs, lymph, kidneys, skin, and blood – through diet and cleansing will help improve the body’s natural detoxification abilities. A healthy eating plan and cleansing routine will fortify your heart right along with every other part of your body. In addition to the antioxidants your body naturally produces, you also obtain antioxidants from your diet. A diet high in antioxidants includes plenty of deeply colored fruits and vegetables. This important step helps decrease oxidative stress and general systemic inflammation. Regular exercise stimulates sweating and the release of toxins from your skin. Different herbal formulas help support the organs of elimination. Next month I plan to discuss cleansing in more detail. In my book, Heart of Perfect Health, I offer information and targeted programs designed to protect your heart for the rest of your life. 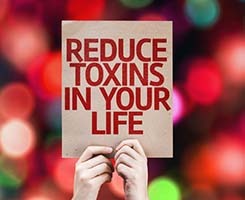 Toxins may be all around us, but we have ways to release them – and renew our health.